Great Grandmaster Leung Ting was the last “closed-door disciple” of the late Grandmaster Ip Man (Yip Man) and is the Golden Rank Founder of the International WingTsun™ Association. He systematized and modernized the system, creating a standard ranking system and teaching methodology as well as a standardized curriculum which has now been taught to approximately 1-2 million people in more than 60 countries. For almost 40 years, he has taught the “Leung Ting WingTsun®” kung fu system and worked hard to establish his trademarks “WingTsun™” and “Wing Tsun™” as synonymous with him and with high quality martial arts instruction. It is shocking to learn that some people have been using Great Grandmaster Leung Ting’s name, photos, uniforms (or deceptively similar ones), and in some cases even his trademarks* without his permission. The instructors of the International WingTsun Association – North American Section (IWTA-NAS) are extremely proud to be the only instructors authorized to teach the “Leung Ting WingTsun®” kung fu system in the USA and Canada. 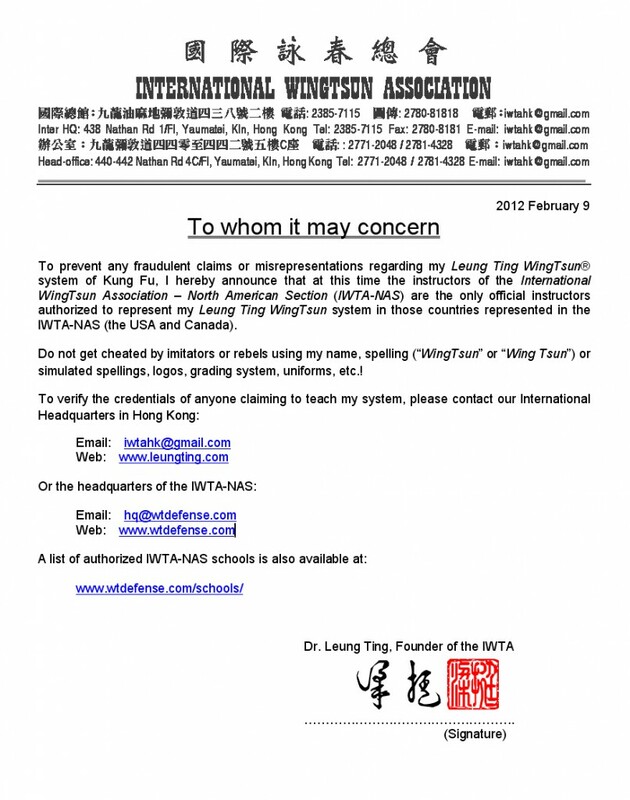 Please see this public statement from Great Grandmaster Leung Ting. 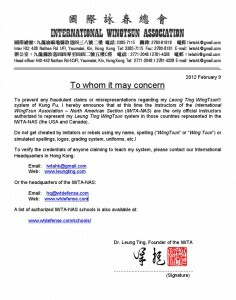 UPDATED DOMAIN NOTES: Please note that since Great Grandmaster Leung Ting’s statement was written in 2012, the primary domain name for the International WingTsun Association – North American Section (IWTA-NAS) has changed from wtdefense.com to leungtingwingtsun.com to make it clear that this site is an official representative of Great Grandmaster Leung Ting and his Leung Ting WingTsun® system. Most links to wtdefense.com now forward from the old domain to the current domain.